In 2016, Kristi Eramo took eighth place in her debut CrossFit Games appearance, the best finish of any female rookie at the Games that year. 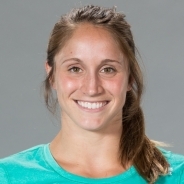 Previously an endurance athlete—in addition to her collegiate swimming career, she took seventh in her age division in the 2011 USA Age Group National Championship Olympic Distance triathlon—Eramo has demonstrated consistent improvement, ascending from 16th in her first regional appearance in 2014 to 10th in 2015, qualifying for the Games in 2016 with a fifth-place regional finish). A trainer at Four Barrel CrossFit East in Louisville, Kentucky, and an accountant by day, she shared the field with her mother, Donna Eramo, who took 10th in the Masters Women 55-59 Division at the 2016 Reebok CrossFit Games.